Salted egg yolk has been an all-time craze these past few years. Whatever dishes that you can think of, there will definitely be a version of the salted egg yolk. Ranging from seafood to spaghetti to burgers to fries… and even cookies! You name it, they have it. But for all those salted egg yolk fans just like me, I don’t think we’ll ever get enough of it. And you’ve guessed it! This Chinese New Year, we have prepared yet another salted egg yolk recipe for you. 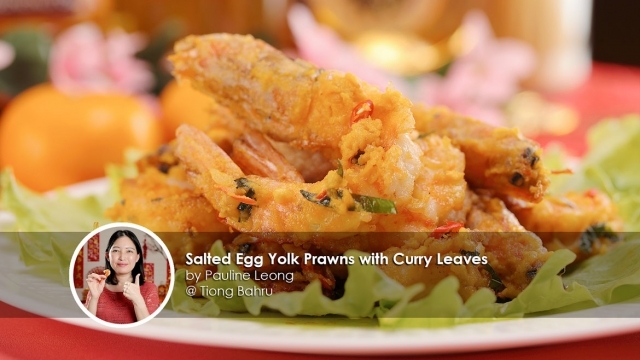 This Salted Egg Yolk Prawns with Curry leaves recipe is shared by one of our passionate home cooks – Pauline Leong. Make this dish this Chinese New Year. It’ll look like gold sitting on the dining table! For this recipe, here are the list of ingredients that you’ll need to prepare: 350g of medium-large grey prawn, 6 pre boiled salted egg yolk – smashed with fork, 1L Knife’s Groundnut Oil ( Healthier Choice ), 5 sprigs of curry leaves – rinsed and dried, 1 chicken egg white, 6 tablespoon of corn starch, ¼ large minced red onion, 2 pieces of chilli padi – cut into smaller pieces, 18g of unsalted butter, 1 teaspoon of oil, 3 tablespoon of water, ½ teaspoon of salt, ½ teaspoon of pepper and ½ teaspoon of sugar. For the prawn marinade, all you’ll need is 1 teaspoon of salt, 1 teaspoon of sesame oil and a dash of pepper. Let’s prepare the prawns first! 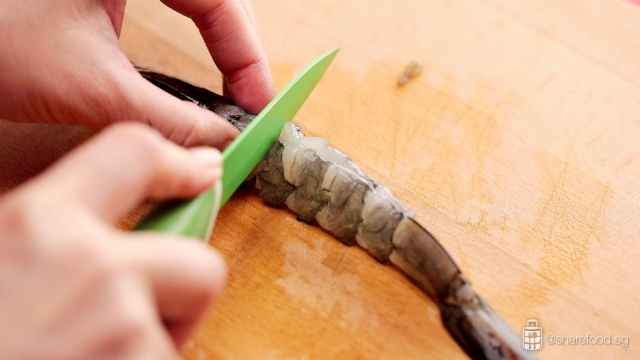 Trim the prawns and leave the head and tail intact. Then, rinse with salt water and pat dry with a kitchen towel. Remove the shell from the body and slit to remove the intestine. Make a few slits on the prawn to straighten it. This will speed up the drying process as well! Wrap it in a towel before transferring it to the chiller for 20 mins to dry up the prawns and to prevent the oil from splattering while deep frying. Remove from the chiller after 20 mins and season with the prawn marinade. Mix well and set aside for 5 mins. Coat the prawn with corn starch and remember to shake off the excess! Next, it’s time to deep fry the prawns. Pour the egg white into the prawns and give it a good mix. Then, coat the prawn with corn starch and remember to shake off the excess and set aside. Proceed to heat up 1 Litre of oil in a pot. Did you know that to test if the oil is hot enough, all you need to do is to place a wooden chopstick in the pot? When you see the oil start to bubble steadily, that means that the oil is hot enough! Alternatively, you can use a kitchen thermometer to get an accurate temperature for deep frying. Give it a try! 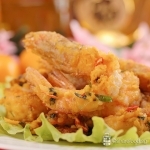 Double frying the prawns will give it an extra crisp and it will absorb the salted egg yolk cream better! Not every oil is suitable for deep frying! In fact, we have used Knife Groundnut Oil for deep frying for this recipe. Peanut oil is known to have a high smoke point of 225℃ and it is commonly used in Asian cooking due to its versatility as it is suitable for all types of cooking! The peanut aroma infused into the oil adds a nutty flavor to your dishes and what’s even better is that it is a healthier choice of oil because it is trans-fat free and lower in saturated fat! Moving on, start to deep fry 3 prawns at 1 time for about 30 seconds or till the prawns turn pale pink. Remove the prawns from the oil and set aside. Repeat the same process until all the prawns are fried. Once completed, allow the oil to heat up again. Double frying the prawns will give it an extra crisp and it will absorb the salted egg yolk cream better! 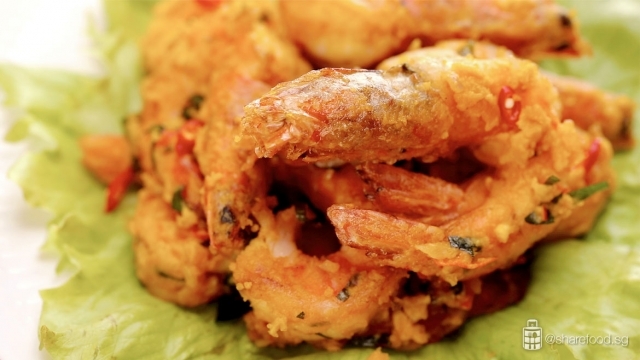 This time, add in all the fried prawns and deep fry it for a second time for about 30seconds. Next, melt the butter in a clean wok. Add in oil and mix well. By adding oil, it will make the salted egg yolk mixture lighter and it will stick better to the prawn! Then, fry some minced onion until fragrant. Add in curry leaves before the smashed salted egg yolk and water. The salted egg yolk smells so good it’ll make you salivate even before eating! Cook until it’s creamy and season with salt, sugar, pepper and chilli padi. Mix well and adjust to taste. Finally, add in the prawns and increase the temperature. Toss and coat the prawns evenly with the salted egg yolk mixture. I bet your kitchen smells so good right now that you can’t wait to taste the food! The aromatic smell of the salted egg yolk will capture the attention of your guests! The aromatic smell of the salted egg yolk will capture the attention of your guests! Make this dish this Chinese New Year. It’ll look like gold sitting on the dining table! Let us know what other salted egg yolk dishes you love and here’s wishing everyone 新年快乐，金玉滿堂! Trim the prawns, leaving the head and tail intact. Rinse it with salt water. Remove shell from the body. Slit to remove the intestine. Make a few slits on the prawn to straighten it. #Tips: This will expedite the drying process. Wrap it in a towel, transfer it to the chiller for at least 20 mins. 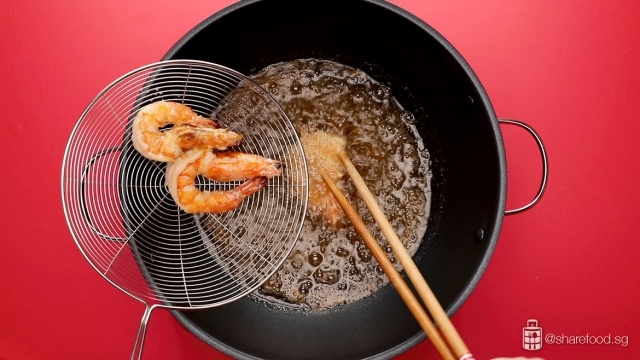 #Tips: This will dry up the prawns and prevent the oil from splattering while deep frying. Season with the prawn marinades and give it a good mix. Set aside for 5 minutes. Pour the egg white into the prawn and give it a good mix. 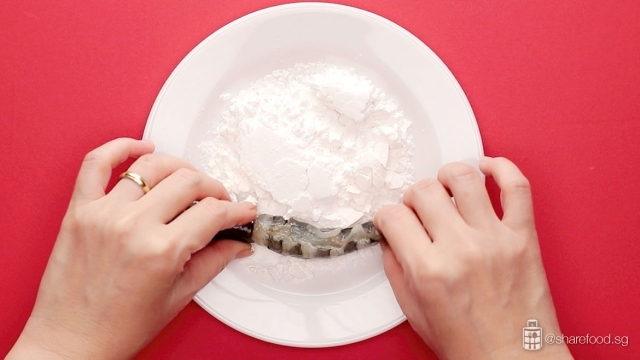 Coat the prawn with corn starch, shake off the excess. Set aside. Heat up 1L oil in a pot. #Tips: To test whether the oil is hot enough, place in a wooden chopstick. When the oil starts to bubble steadily, the oil is ready. Deep fry 3 prawns at 1 time for about 30 sec or till the prawn turns pale pink. Remove from oil and set aside. Repeat the same process till all the prawns are fried. Once completed, allow the oil to heat up again. Add in all the fried prawns and deep fry it for the 2nd time for about 30 sec, do not over-fried the prawns. Lift up and drain. 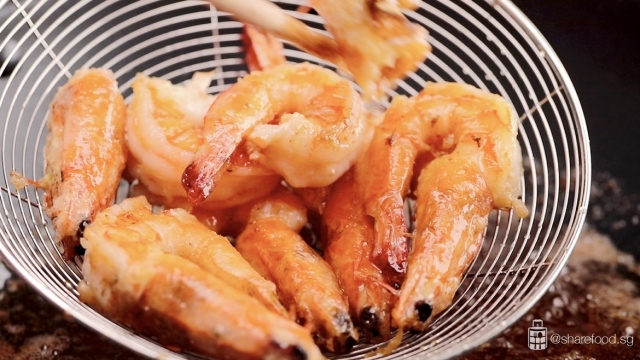 #Tips: This double-frying method will give the prawn an extra crisp and it will absorb the salted egg yolk cream better! In a clean wok, melt the butter. Add in oil and mix well. 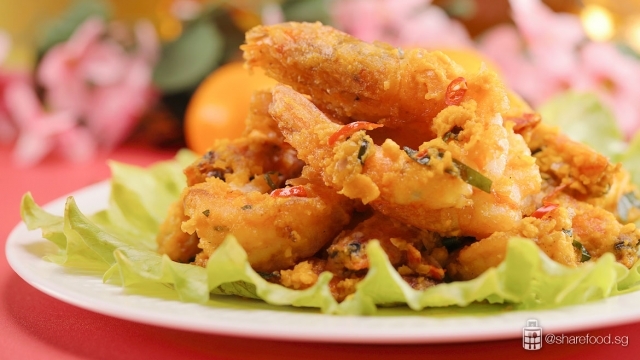 #Tips: Instead of adding more butter, oil will make the salted egg mixture lighter and sticks better to the prawn. Add in minced onions and fry till fragrant. Add in curry leaves, fry till fragrant. Add in smashed salted egg yolk and water, cook it till it’s creamy and bubbles are formed. Season with salt, sugar, pepper and chilli padi. Mix well and adjust to taste. Add in prawns and increase the temperature. Toss and coat it evenly with the salted egg yolk mixture.